A semi-trailer truck, also known as a semi, tractor-trailer, big rig, eighteen-wheeler, or (in the United Kingdom and Ireland) articulated lorry or artic is a vehicle that has a towing tractor and a semi-trailer that carries the freight. They use diesel fuel. back of cab and frame. A semi-tractor has no body and does not carry any cargo on it. The front of a semi-trailer is put on it. Only the rear of the trailers have wheels, so the tractor pulls the trailer and carries the front part of the trailer's weight. The tractor and driver cost as much as a truck, but the trailers don't cost very much. You can have more trailers than tractors and the tractors can change trailers easily. The tractor and driver do not have to wait to be loaded or unloaded, they can change trailers. They can also pull different kinds of trailers, any type that is needed at the time. In the UK and EU roads are smaller and turn more. Trucks have to be shorter. Most are cab-over-engine models (COE). The driver sits over the engine and the front of the cab is flat. Shorter trucks can weigh more. Trailers can have three axles under the load, and short semi-tractors with two axles. These have the same weight and number of axles as a long semi-truck. They take up less space and can turn better. Different countries drive on different sides of the road. This is named for the side the driver sits on. The UK is the main right-hand drive (RHD) country. Most countries that were British colonies are RHD. The EU and most other countries are LHD. Italy is LHD but they drive on the left side of the road. This is good in mountains. The driver is near the edge of the road. The US was British but is LHD. Canada (next to the US) is LHD. When you are building a truck LHD or RHD is not important. Australia builds US type Mack and International trucks with RHD. Semi-trailers can be the same types as trucks. Because they don't cost as much as a truck they can also be special types. Shipping containers are large and heavy. In some countries special laws cover them. Skeleton frame trailers are built to carry them. Long semi-trailers are used for logs. In the UK and EU some logs are smaller. The trailers are 2 or 3 logs long. They have a crane to load them. 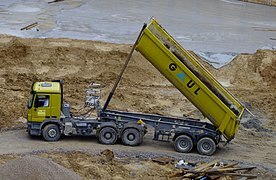 In the US "lowboys" (the load is just above the road) carry large construction machines. Special trailers can be built for very big loads. Australia "road-trains" can pull 4 trailers. ↑ "Federal Size Regulations for Commercial Motor Vehicles". US Department of Transportation. Retrieved 22 August 2017. ↑ "Freight Management and Operations: Bridge Formula Weights". US Department of Transportation. 21 May 2015. Retrieved 22 August 2017. ↑ "A Guide to Haulage & Courier Vehicle Types & Weights (UK)(easy read table)" (PDF). Returnloads.net. Retrieved 23 August 2017. ↑ "Permissible Maximum Dimensions of Lorries in Europe (easy read table)". International Transport Forum. 2015. Retrieved 23 August 2017. ↑ "Permissible Maximum Weights of Trucks in Europe (easy read table)". International Transport Forum. 2011. Retrieved 23 August 2017. ↑ "Council Directive 96/53/EC laying down for certain road vehicles circulating within the Community the maximum authorized dimensions in national and international traffic and the maximum authorized weights in international traffic". EUR-Lex. p. Annex 1. Retrieved 23 August 2017. ↑ Carroll, John; Davies, Peter (2015). The Illustrated Encyclopedia of Tractors & Trucks. Hermes House. pp. 312–315. ISBN 978-1-84309-689-4. This page was last changed on 29 August 2017, at 20:03.